Question Oppositional defiant and conduct disorders (ODD and CD) start early and persist, incurring high individual and collective costs. To inform policy and practice, we therefore asked: What is the best available research evidence on preventing and treating these disorders? Study selection and analysis We sought randomised controlled trials (RCTs) evaluating interventions addressing the prevention or treatment of behaviour problems in individuals aged 18 years or younger. Our criteria were tailored to identify higher-quality RCTs that were also relevant to policy and practice. We searched the CINAHL, ERIC, MEDLINE, PsycINFO and Web of Science databases, updating our initial searches in May 2017. Thirty-seven RCTs met inclusion criteria—evaluating 15 prevention programmes, 8 psychosocial treatments and 5 medications. We then conducted narrative synthesis. Findings For prevention, 3 notable programmes reduced behavioural diagnoses: Classroom-Centered Intervention; Good Behavior Game; and Fast Track. Five other programmes reduced serious behaviour symptoms such as criminal activity. Prevention benefits were long term, up to 35 years. For psychosocial treatment, Incredible Years reduced behavioural diagnoses. Three other interventions reduced criminal activity. Psychosocial treatment benefits lasted from 1 to 8 years. While 4 medications reduced post-test symptoms, all caused important adverse events. Conclusions Considerable RCT evidence favours prevention. Clinical implications Effective prevention programmes should therefore be made widely available. Effective psychosocial treatments should also be provided for all children with ODD/CD. But medications should be a last resort given associated adverse events and given only short-term evidence of benefits. Policymakers and practitioners can help children and populations by acting on these findings. To begin to address the shortfalls and imbalances, policymakers need robust research evidence to guide public spending priorities. In parallel, practitioners need robust research evidence to inform the implementation of more effective programmes and services for children. To inform policy and practice, we therefore asked: what is the best available research evidence on preventing and treating ODD and CD? To provide comprehensive information, we included the full intervention continuum: prevention programmes, psychosocial treatments and pharmacological treatments. We were aware of only 1 such previous comprehensive review of ODD/CD interventions, Connor et al (2006),27 which covered studies published from 1980 to 2005. We specifically built on this review, covering older studies (published from 1965 onwards) as well as newer studies (published from 2005 through 2017). We also expanded on previous reviews that examined only prevention (eg, Waddell et al, 2007),28 only treatment (eg, National Collaborating Centre for Mental Health, 2013)29 or only specific types of interventions (eg, Woolfenden et al, 2002; Barlow et al, 2011; Sanders et al, 2014; Bakker et al, 2017).30–33 To our knowledge, no recent systematic review has covered this comprehensive range of ODD/CD interventions. We first searched the CINAHL, ERIC, MEDLINE and PsycINFO databases using the terms: conduct disorder, oppositional defiant disorder, child behaviour disorder, aggressive behaviour OR juvenile delinquency AND prevention, intervention OR treatment. To identify additional studies, we searched the journal, Evidence-Based Mental Health, and searched the Cochrane and Campbell Collaboration databases, identifying relevant systematic reviews that we then hand-searched. We applied limiters, seeking only randomised controlled trials (RCTs) evaluating interventions addressing the prevention or treatment of behaviour problems in individuals aged 18 years or younger. We limited our searches to English-language articles due to most research being published in this language and due to translation capacity not being available within the team. We also chose to seek articles published over the past 50 years (January 1965 through May 2017, which was the time of the last search update) to ensure comprehensiveness while also ensuring complete coverage of important databases such as MEDLINE and ERIC, which began in 1966. Following these searches, after screening the titles, 2 authors independently assessed all relevant abstracts to identify eligible RCTs. Subsequently, 2 authors independently assessed all retrieved articles, identifying RCTs that met all the inclusion criteria. We then identified supplemental publications on these RCTs by searching the Web of Science database using intervention names, author names and article titles. This added search yielded new follow-up data from the previously identified RCTs as well as new RCTs that were assessed using the procedures noted above. Table 1 shows the inclusion criteria. Figure 1 shows the search process. Next, we evaluated the overall quality of the findings. We deemed interventions ‘notable’ if RCTs showed significant reductions in rates of childhood ODD/CD and/or adult ASPD diagnoses, given that diagnostic outcomes are a particularly robust indicator of effectiveness. We also noted effect sizes, where available, for both diagnostic and behaviour symptom outcomes. Meanwhile, we deemed adverse events associated with medications to be ‘important’ if they included any of the following symptoms: neurological (dizziness, nausea, vomiting, dystonia, drooling, tremor, headache or diplopia); gastrointestinal (abdominal pain); cardiovascular (tachycardia); endocrine (increased prolactin levels); genitourinary (excessive thirst or excessive urination) and psychiatric (sedation, fatigue, irritability, restlessness or anxiety). This review was registered with PROSPERO (registration number CRD42016052643; see www.crd.york.ac.uk/PROSPERO/). Incredible Years was evaluated in 3 RCTs, while the Positive Parenting Program (Triple P) was evaluated in 2 RCTs. As well, 2 RCTs evaluated 2 different programmes: Classroom-Centered Intervention and Family School Partnership, each assessed independently; and Triple P and Promoting Alternative Thinking Strategies (PATHS), each assessed both independently and in combination. Most programmes included parent training. Many also focused on developing children’s social skills and/or their academic skills. All programmes were delivered in community settings such as homes, preschools and schools. Three interventions were delivered universally, while 12 were delivered to children at risk or their parents. Intervention duration ranged widely—from 1 month to 10 years. Six additional programmes significantly reduced at least 1 behaviour symptom. These included: Chicago Parent Program (behaviour problems);w55 Family Check-Up (behaviour problems);w60 Family School Partnership (behaviour problems, d=0.29 and school suspensions, OR=0.59);w53–w54 Incredible Years Basic (behaviour problems, d=0.63 and 0.89)w65 and coupled with Incredible Years Enhanced (aggression);w67 Research-Based Developmentally Informed (REDI) program (behaviour problems, d=0.25);w74 and Triple P I (behaviour problems)w49 and II (behaviour problems and aggression, d=0.11 and 0.15, respectively).w51 Only 2 interventions failed to show any behaviour benefits at relevant follow-up: Montreal Prevention Program w68-w69 and PATHS.w51 Table 2 summarises the 15 programmes and their evaluations. Reported effect sizes varied, as noted above. For reductions in diagnoses, these ranged from OR=0.42 (for Classroom-Centered Intervention) to OR=0.60 (for Fast Track). For reductions in criminal behaviours, these ranged from d=0.27 (for Coping Power) to OR=0.48 (for Perry Preschool). Effect sizes for reductions in general behaviour symptoms, meanwhile, ranged from d=0.11 (for Triple P II) to d=0.89 (for Incredible Years Basic). These numbers suggest modest-to-moderately robust effects overall. Adverse events were not reported for any of the included prevention programmes. Thirteen RCTs met inclusion criteria, evaluating 8 different psychosocial treatments.w76–w93 All included parents in at least 1 version of the intervention. Five also intervened directly with children, eg, providing cognitive-behavioural therapy or social skills training. Some also provided family therapy. Treatments were delivered in clinics as well as homes, schools and other community settings. One intervention involved placing youth in specialised foster homes. Interventions were relatively short—ranging from 2 weeks to 7 months. Five of 8 psychosocial treatments significantly reduced diagnoses or symptoms or both. One treatment—Incredible Years—was notable for significantly reducing ODD diagnoses. Incredible Years Basic reduced ODD diagnoses at 7.8 year (final) follow-up (OR=0.20).w77 Incredible Years Basic Plus Literacy also reduced ODD diagnoses at 4-month follow-up (OR=0.30);w79 however, by 5.8-year (final) follow-up, this outcome was no longer statistically significant.w77 Three programmes stood out for significantly reducing particularly serious behaviour symptoms, namely engagement in criminal activities or days incarcerated. These treatments included: Brief Intervention–Youth Only (arrests);w76 Multidimensional Treatment Foster Care I (violent offences)w80 and II (days incarcerated);w82 and Multisystemic Therapy II (criminal activities, OR=0.41)w84 and IV (property offences, d=0.37).w87 One other programme, Parent-Child Interaction Therapy, reduced 1 (non-criminal) symptom (behaviour problems, d=0.61–0.64).w90 The remaining 3 programmes—Parent Management Training–Oregon, Protocol for Onsite Nurse-Administered Intervention and Strongest Families—failed to produce positive behaviour outcomes at relevant follow-up.w91–w93 Table 3 summarises the 8 psychosocial treatments and their evaluations. Reported effect sizes varied, as noted above. For reductions in diagnoses, effect size was OR=0.20 (for Incredible Years Basic). For reductions in criminal behaviour, effect sizes ranged from d=0.37 (for Multisystemic Therapy IV) to OR=0.41 (for Multisystemic Therapy II). The one programme that reduced general behaviour symptoms had effect sizes of d=0.61–0.64 (for Parent-Child Interaction Therapy). These numbers suggest modest-to-moderately robust effects overall. Adverse events were not reported for any of the included psychosocial treatments. Eight RCTs met inclusion criteria, evaluating 5 different medications: 3 antipsychotics (haloperidol, quetiapine and risperidone), 1 antiepileptic (carbamazepine) and 1 mood stabiliser (lithium).w94–w101 RCTs were conducted in inpatient and outpatient settings. All RCTs assessed outcomes at post-test but not beyond, and assessed symptoms but not diagnoses. All pharmacological treatments succeeded in reducing child behaviour symptoms with the exception of carbamazepine. Two RCTs also provided data on effect sizes, showing large benefits. Specifically, lithium significantly reduced the odds of children experiencing behaviour symptoms (OR=9.3)w97 while quetiapine significantly reduced symptom severity (d=1.6).w98 However, adverse events were reported for most children across all the RCTs—100% of children in some cases. As well, important adverse events were noted for at least 50% of intervention children in at least 1 RCT for all medications. These problems included: dizziness (carbamazepine);w94 sedation and dystonia (haloperidol);w95 nausea, vomiting, excessive thirst and excessive urination (lithium);w97 irritability, restlessness, agitation, anxiety and sedation (quetiapine);w98 and fatigue and sedation(risperidone).w99 w101 Table 4 summarises the 5 pharmacological treatments and their evaluations. Applying the Cochrane risk-of-bias assessment tool,34 we identified the following indicators of risk for our included RCTs. For prevention studies, selection bias was unclear for most; performance bias was high for all; detection bias was low for most; and attrition and reporting biases were low for all. For psychosocial treatment studies, selection bias was unclear for most; performance bias was high for all; detection bias was high for most and attrition and reporting biases were low for all. For medication studies, meanwhile, selection bias was unclear for most, while performance, detection, attrition and reporting biases were low for all. The overall risk-of-bias profile was therefore more favourable for medication compared with psychosocial studies. Nevertheless, even though many outcome measures for the prevention and psychosocial treatment RCTs were not blinded, a further audit found that more of the blinded outcomes were statistically significant than the non-blinded (42.9% vs 31.5%, respectively), suggesting that the lack of blinding did not create a bias favouring these types of interventions. Please see the online supplementary appendix for risk-of-bias assessments for individual RCTs. Childhood ODD and CD incur high individual and collective costs, in part because effective prevention and psychosocial treatment interventions are not made widely available. 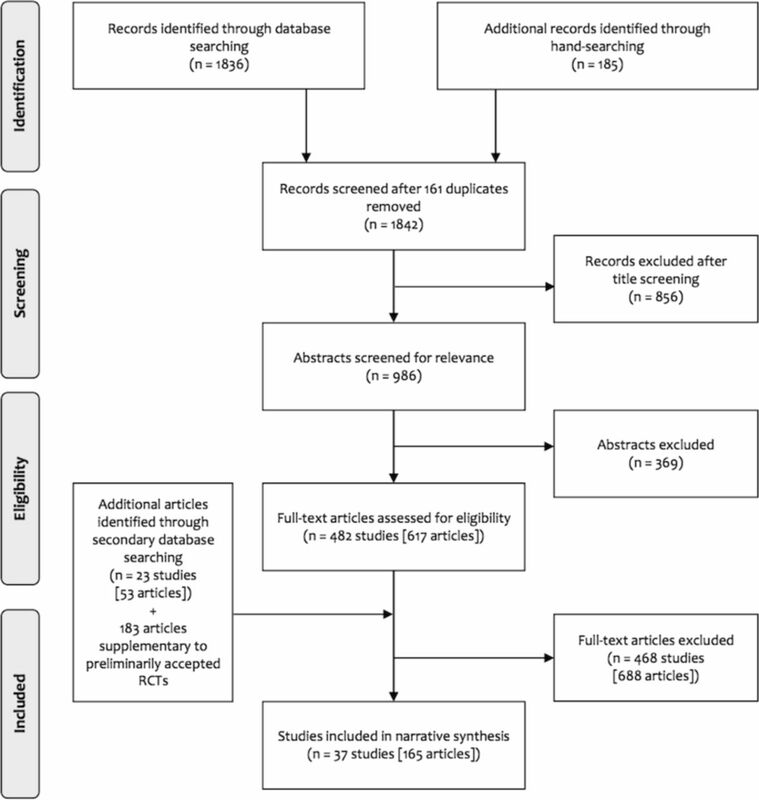 Conducted to encourage improvements in policy and practice, this systematic review identified 37 RCTs evaluating 15 prevention programmes, 8 psychosocial treatments and 5 pharmacological treatments. For prevention, 3 programmes reduced behavioural diagnoses (Classroom-Centered Intervention; Good Behavior Game and Fast Track) while 5 programmes reduced serious behaviour symptoms such as criminal activity (Coping Power; Fast Track; Nurse-Family Partnership, Parent Management Training–Oregon and Perry Preschool). Prevention benefits were long term, up to 35 years. For psychosocial treatment, 1 intervention reduced behavioural diagnoses (Incredible Years) while 3 interventions reduced criminal activity (Brief Intervention; Multidimensional Treatment Foster Care and Multisystemic Therapy). Psychosocial treatment benefits lasted from 1 to 8 years. Meanwhile, 4 medications, mainly antipsychotics, reduced post-test symptoms, yet all caused important adverse events. Yet our review has limitations. We only reported on outcomes directly pertaining to ODD/CD. However, several prevention programmes showed other important benefits including: reducing child maltreatment (Nurse-Family Partnership);35 reducing child suicidal ideation (Good Behavior Game)36 and improving adult employment (Perry Preschool).37 Likewise, some psychosocial treatments showed other benefits such as reducing substance use (Multisystemic Therapy)38 and reducing attention-deficit symptoms (Strongest Families).39 Another limitation pertains to the lack of attention in the prevention and psychosocial treatment studies to the issue of possible adverse effects. For example, interventions such as Nurse-Family Partnership entail greater family scrutiny, which may lead to adverse effects (from the family’s perspective) such as additional child protection reporting; likewise, targeted programmes entail identifying children at risk, which may lead to potential stigma. Future prevention and psychosocial treatment research should attend to these issues. Our inclusion criteria for blinding also differed between psychosocial and medication studies, which may introduce bias favouring psychosocial studies. We took this approach to allow us to include a reasonable number of psychosocial intervention studies, where double blinding (and placebo controls) may not be feasible. As well, we required that psychosocial interventions have follow-up after post-test of at least 3 months, while only requiring post-test follow-up for medications. Still, risk-of-bias assessment for all included studies nevertheless confirmed more favourable profiles for medication compared with psychosocial studies, as acknowledged in the findings. Yet another limitation may arise from setting high thresholds for study inclusion. As a result, we do not discuss myriad interventions where we did not find RCT evaluations even though these interventions are likely being used—including some that may be ineffective. That said, we hope that our approach may serve as a pragmatic model for policymakers and practitioners. Namely, when interventions are lacking RCT evidence of effectiveness, they should only be used if there is a commitment to evaluating outcomes to ascertain the benefits for children. Based on this review, the case for prevention appears to be particularly strong—with 13 programmes showing positive findings, many at long-term follow-up. Most successful programmes focused on children at risk, suggesting that targeted approaches may be particularly beneficial in ameliorating early adversities, arguably even constituting a form of ‘proportionate universalism’.40 Many, furthermore, focused on the early years, suggesting greater benefits with ‘upstream’ approaches. Parent training was also a central feature of many successful programmes, suggesting that supporting parents is crucial. Beyond positive child outcomes, US cost analyses have also been favourable for several effective prevention programmes, suggesting that they may pay for themselves. These US evaluations have factored in intervention costs as well as estimates of reduced additional service use across multiple sectors over 10–15 years or more—including criminal justice, social services, education and healthcare. Net benefits per participant have been suggested for: Good Behavior Game (US$10 800, 2017 equivalency); Nurse-Family Partnership (US$5 100, 2017 equivalency) and Parent Management Training–Oregon (US$5 700, 2017 equivalency).12 Fast Track was also estimated to be cost-effective but only for the highest-risk children.41 For Perry Preschool, meanwhile, US estimates have suggested returns of 6–13 dollars for every programme dollar invested.42 Estimates will vary according to countries and methods used; such estimates may nevertheless be helpful in encouraging more widespread adoption of effective prevention programmes. Yet even if effective prevention programmes are made widely available, they could not avert all new ODD or CD cases. Treatment will always be needed. According to this review, Incredible Years was notable for reducing ODD diagnoses, while Brief Intervention, Multidimensional Treatment Foster Care and Multisystemic Therapy reduced criminal activity. Psychosocial treatment benefits lasted from 1 to 8 years—considerable time in the life of a child. US cost analyses were also favourable for one effective programme: Multidimensional Treatment Foster Care. Factoring in programme costs as well as estimated lifetime reductions in the use of additional criminal justice, social, education and healthcare services, net benefits per participant have been suggested (US$9 400, 2017 equivalency).12 (Costs analyses were also available for Incredible Years but none exclusively focused on the RCTs we reviewed.) Yet with only 5 psychosocial treatments showing effectiveness, new research is needed to delineate more options. We also concur with previous reviewers who have noted the modest effect sizes for most psychosocial treatments for ODD/CD, especially when treatments begin when children are older33—such that more research is warranted, particularly with younger age groups. In comparison, in the medication studies we reviewed, child benefits were short-term and frequently associated with important adverse events. Some of these adverse events were fairly rare and could likely be managed clinically. Yet these findings are still concerning given well-documented overprescribing to children23–26—in a context where effective prevention programmes and psychosocial treatments are not widely available.16 43 As well, prescriptions for behaviour problems have often involved ‘off label’ use—raising additional risks for children.44 The lack of long-term follow-up studies on these medications is a further cause for concern given the evidence amassing on cardiovascular, cognitive and other harms associated with the long-term use of antipsychotics such as risperidone and quetiapine in children.26 45 More research is therefore needed on pharmacological treatments for childhood ODD/CD, better delineating long-term risks and benefits. On balance, most of the research evidence that we identified favours prevention. Yet substantial hurdles need to be overcome to implement this evidence. Foremost, in many wealthy countries, most health spending goes towards providing healthcare after problems are established. In the UK and Canada, for example, only approximately 5% of overall health spending is allocated to public health including prevention.17 19 Policymakers will need to take concerted leadership to shift these spending patterns, even by modest amounts. Yet some countries are excelling at improving children’s mental health services, showing that the shortfalls and imbalances can be addressed. Australia, for example, has doubled the proportion of children with mental disorders who are receiving services—from one-third in 1998 to two-thirds in 2014—by making significant new prevention and treatment investments.46 Beyond this, many prevention programmes require cross-sectoral collaboration for effective implementation. For instance, Classroom-Centered Intervention, Good Behavior Game and Fast Track were delivered in schools, involving teachers, while Nurse-Family Partnership was delivered in homes, involving public-health nurses. So novel collaborations among children’s mental health agencies, public health agencies, schools and others will need to be established and sustained where these do not exist. Making prevention a priority while ensuring the availability of effective treatments will also require concerted efforts from practitioner groups. Physicians—and their professional regulatory bodies—could take leadership in addressing medication overprescribing. Physicians as well as other practitioner groups including psychologists, social workers, nurses, teachers, child protection workers and school counsellors could engage in promoting effective prevention and psychosocial interventions for ODD/CD. All practitioner groups could also take leadership in embracing intervention models that move the children’s mental health field away from focussing only on individual approaches, reaching just one child at a time, towards also reaching many more children through population-level interventions, such as the effective prevention programmes highlighted here. Policymakers can assist with these efforts by funding effective interventions and by supporting practitioners to provide these. Considerable RCT evidence favours prevention, according to this review. Effective prevention programmes should therefore be made widely available. Effective psychosocial treatments should also be provided for all children with ODD/CD. But medications should be a last resort given associated adverse events and only short-term evidence of benefits. While more research is needed, particularly on psychosocial interventions and on medications, policymakers and practitioners can nevertheless help children by acting on these findings now. Yet the aim is not to favour only prevention programmes, but rather, to achieve a balance of public investments—in effective interventions across the prevention and treatment continuum, so that all children in need are reached. The well-being of children and of populations is in the balance. References 48-104 will appear online only, and can be found in the supplementary appendix. American Psychiatric Association (APA). Diagnostic and Statistical Manual of Mental Disorders. 5th Edition. Washington, DC: APA, 2013. World Health Organization (WHO). International Statistical Classification of Diseases and Related Health Problems. 10th Revision: ICD-10. Geneva: WHO, 2016.
. Creating mentally healthy communities, starting with children. In: The Canadian Population Health Initiative, eds. Mentally healthy communities: a collection of papers. Ottawa, ON: Canadian Institute for Health Information (CIHI), 2008:45–58. Washington State Institute for Public Policy (WSIPP). Benefit-cost results. Updated 2017 www.wsipp.wa.gov/BenefitCost (accessed Nov 2017).
. Child and youth mental disorders: prevalence and evidence-based interventions. Vancouver, BC: Children’s Health Policy Centre, Faculty of Health Sciences, Simon Fraser University, 2014. Office for National Statistics. UK Health Accounts: 2015. Apr 2017. www.ons.gov.uk/releases/ukhealthaccounts2015 (accessed Nov 2017). CIHI. National health expenditure trends, 1975 to 2017. Ottawa, ON: CIHI, 2017.
WHO. Mental health atlas 2014. Geneva: WHO, 2015.
. Juvenile maladaptive aggression: a review of prevention, treatment, and service configuration and a proposed research agenda. J Clin Psychiatry 2006;67:808–20. National Collaborating Centre for Mental Health. Antisocial behaviour and conduct disorders in children and young people: the NICE guideline on recognition, intervention and management. Great Britain: The British Psychological Society and The Royal College of Psychiatrists, 2013.
. Cochrane handbook for systematic reviews of interventions, version 5.1.0. Updated Mar 2011 www.handbook-5-1.cochrane.org (accessed Nov 2017).
. Long-term effects of home visitation on maternal life course and child abuse and neglect. Fifteen-year follow-up of a randomized trial. JAMA 1997;278:637–43.
. Fair society, healthy lives: a strategic review of health inequalities in England post-2010. London, UK: Department of Epidemiology and Public Health, University College London, 2010.
. Preventing mental disorders in children: a public health priority. Can J Public Health 2007;98:174–8.
. The mental health of children and adolscents: report on the second Australian Child and Adolescent Survey of Mental Health and Wellbeing. Canberra 2015. Contributors CW developed the idea for the review and wrote the manuscript. CS extracted relevant data, interpreted the data and contributed to the manuscript. CA and JLB conducted the literature searches, extracted relevant data and contributed to the manuscript. DY extracted relevant data and contributed to the manuscript. All authors approved the final version. Funding This work was supported by the Canada Research Chairs Program (grant number 950-228413, dated 1 March 2013) and by the British Columbia Ministry of Children and Family Development (grant number SL00444S01, dated 11 April 2011, modified 30 December 2015). Competing interests CW is coleading a randomised controlled trial on Nurse-Family Partnership, one of the interventions is discussed in this systematic review.